Amalienborg Palace is a unique palace complex in the central part of the Danish capital - Copenhagen. Castle Amalienborg is the official winter residence of the royal family in Denmark. After a devastating fire on February 26th, 1794, the official headquarters of the royal family Christiansborg, which was located on an islet in the center of Copenhagen - Slotsholmen, was burned so, the Danish king bought the Amalienborg Palace. Immediately thereafter Amalienborg became the official royal seat. Amalienborg Castle consists of four noble buildings, all built in Baroque style, enclosing a beautiful octagonal courtyard in the middle. In the middle of this yard stands the monumental statue of the founder of the Amalienborg - King Frederick V.
The complex was built up of four noble families of Copenhagen. Amalienborg was donated free of charge and they were exempt from taxes. In return for the preferences that the nobles had to build the beautiful buildings that meet the proper time for architectural criteria and for a specified period of time. The Palace Complex Amalienborg rises in Frederiksstaden, which is located on two previous earlier palaces. The first castle at this place was called Sophie Amalienborg Palace and was built by Queen Sophie Amalie in 1600, who was the wife of Frederick III. Today the composition of Amalienborg comprises four beautiful Baroque buildings. They are Castle Christian VII, known as the Palace of Moltke, the castle of Christian VIII, originally known as, Levetzau's Palace, the palace of Frederick VIII, whose original name is Brockdorff's Palace and the fourth noble building that is Christian IX, formerly known as, Schack's Palace. Today the castle complex from Brokdorf Amalienborg features a clock on the facade that was the former home of Queen Mother Ingrid until her death in 2000. Currently living there is Crown Prince Frederik and Crown Princess Mary. The statue of King Frederik V is in the center of the garden of Amalienborg and was erected permanently in 1771. It is a work of Arab sculptor - JJ Saly. This statue depicts a king astride a horse standing in a posture of a Roman emperor. 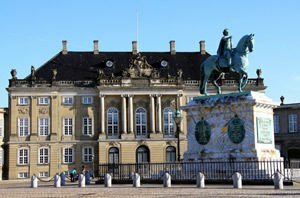 Statue of Frederick V in the courtyard of Amalienborg is one of the most famous and iconic equestrian statues in the world.